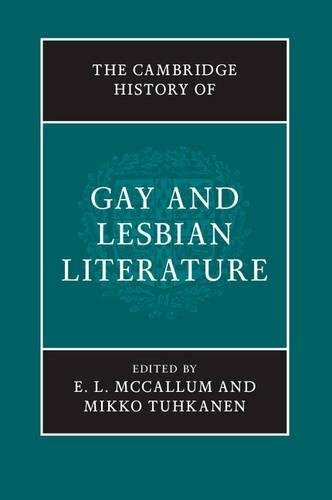 The Cambridge History of Gay and Lesbian Literature presents a global history of the field and is an unprecedented summation of critical knowledge on gay and lesbian literature that also addresses the impact of gay and lesbian literature on cognate fields such as comparative literature and postcolonial studies. Covering subjects from Sappho and the Greeks to queer modernism, diasporic literatures, and responses to the AIDS crisis, this volume is grounded in current scholarship. It presents new critical approaches to gay and lesbian literature that will serve the needs of students and specialists alike. Written by leading scholars in the field, The Cambridge History of Gay and Lesbian Literature will not only engage readers in contemporary debates but also serve as a definitive reference for gay and lesbian literature for years to come. This volume presents a global history of gay and lesbian literature that covers a wide range of topics, from Sappho and the Greeks to contemporary science fiction and fantasy. Grounded in current scholarship, the History provides new critical approaches to gay and lesbian literature that will serve the needs of students and specialists alike. E. L. McCallum is Associate Professor of English at Michigan State University. Her essays have appeared in journals such as Technoculture, Postmodern Culture, Poetics Today, Differences, Arizona Quarterly, and Camera Obscura, as well as in a number of edited collections.